Assistance League of Ventura County is celebrating the 25th anniversary of its signature philanthropic program, Operation School Bell®. The program provides clothing to school-aged children who have been referred to the program through their schools. 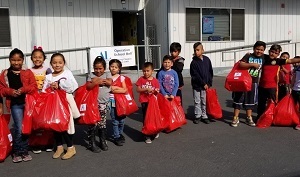 This year, students were bussed to Junipero Serra Elementary school in Ventura where 40 volunteers assisted in picking out appropriately sized clothing and received school supplies and toiletries as well as gift cards to Target and Payless Shoes. For more information and the program and to volunteer for or donate to the Assistance League, visit www.assistanceleagueventuracounty.org.